Only an Avatar (incarnation of God) could say those words. Lesser souls like seers, spiritual aspirants, great souls ascetics, and realized persons would not have the courage to utter them, and even if they mustered enough strength, the words would not have the ring of authenticity. About four years ago, I went from Bangalore to Puttaparthi by night train. When I reached the place by 10 A.M. I peeped into the old temple near the village on my way to the new ashram and was shocked by the heavy cloud of sadness that hung over it. Baba” brother –in-law (as we, with our limited family outlook, do prattle in delusion) Sri Subba Raju, Baba's sister's husband, who was also his maternal uncle, had passed away the previous evening and was buried late at night. I had known him as a good and active worker at the Prashanthi Nilayam, with a kind enquiry always on his lips, and so I was overwhelmed with sorrow. I also felt great anguish when I thought of the bereaved lady and her only son, a sweet little boy. With a heavy heart I moved towards the Nilayam, half apprehensive to meet there the stricken brother and nephew (Baba) and doubting all the time whether the words I might use would be enough to express my sorrow and convey my sympathy in front of Him. The bereaved lady was evidently inside the Nilayam for her lamentation could be heard out side. Dark despair lay thick on every face and all were eagerly watching Baba's lips, waiting for His words. Since I had not yet heard those words which only an Avatar could say, I had foolishly manufactured on my way to Prashanti Nilayam a sentence of consolation in the conventional style to be spoken to Him. But luckily, before I could commit that sacrilege, Baba looked at me with a be witching smile and, seeing my tears, He said, "Why? What is this? Don't you know me? If there is no birth and no death, how am I to pass my time? And then He laughed! "How am I?… "Birth and death"… pass my time"?… What a profound utterance and before what an audience and against what a background! 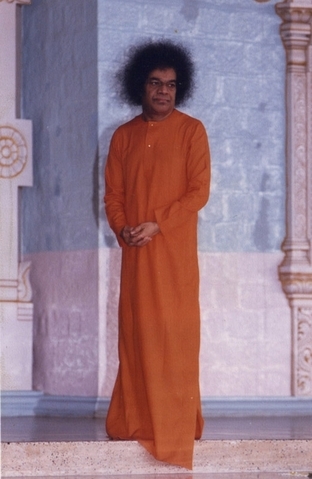 I saw before me not Baba with a physical body 28 years old, but an Avatar of the Lord Himself. Who else could have the courage? Who else could infuse into those words that true ring of authenticity? Ponder over this, … Brother reader, that is my prayer.